Irvine, Calif. – July 9, 2014 – A shining new eight-story hotel now adorns the skyline in the Irvine Spectrum, where R.D. 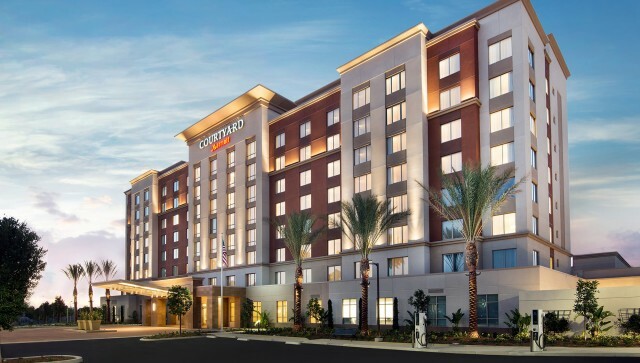 Olson Development has unveiled its latest project, the 210-room Courtyard by Marriott in Irvine, Calif. The hotel is officially open for business today following a ribbon-cutting ceremony that was attended by executives from R.D. Olson Development and R.D. Olson Construction, Irvine Company, WATG, Marriott International and Irvine Mayor Steven Choi. The $50 million project is the centerpiece hotel property for the Irvine Spectrum, with design features and amenities befitting a boutique fullservice hotel. The attentive architectural elements are the work of WATG, highly regarded as a worldwide leader in hospitality design. The new hotel also represents the Southern California debut of Marriott’s latest Gen Next design and features an interior theme that celebrates the rich history of the Irvine Ranch. 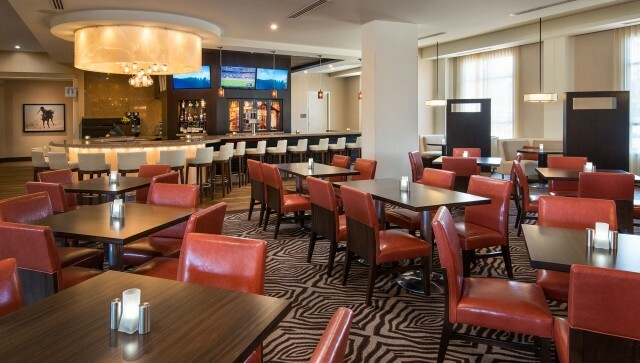 Upon entry, guests are immersed in a refined design with rustic accents, such as distressed wood floors and high-back leather chairs, yet with the modern conveniences expected by today’s business and leisure travelers. “This project has special features not found in any other Courtyard property, and we are proud to be a part of bringing this excellent hotel to the heart of the Irvine Spectrum,” said Bob Olson, CEO and founder of R.D. Olson Development. other items of interest. Semi-enclosed Media Pods with flat-panel TVs offer a place to work, meet or relax. Guest rooms include technology features at the leading edge of hotel design, with free highspeed Wi-Fi, convenience plugs and iPhone/iPod docking stations. Smart TVs with full connectivity are featured, along with DVRs that enable guests to pause or record live broadcasts just as they would at home. Guests can even stream their Netflix, Hulu or other media subscriptions free of charge, ending the need to pay for hotel movies. The hotel has an oversized 25-meter salt water lap pool and four technology-laden pool cabanas, a Courtyard by Marriott first, with smart TVs, sound systems and high-speed Wi-Fi. Additional public space amenities include a spa area, fire pits and a putting green. A spacious 1,800-square-foot fitness center offers the latest in cardio and elliptical machines, weights, a TRX workout section and CrossFit workout gear. 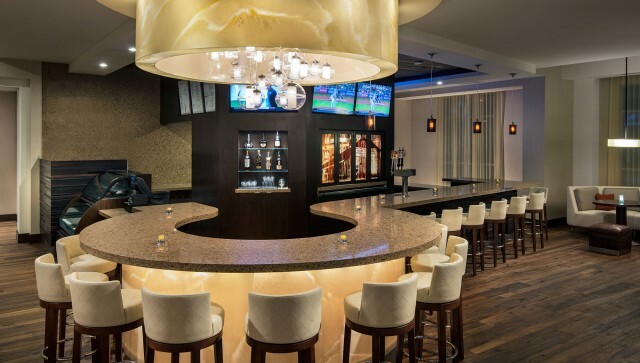 The lounge area features a hip, stylish bar that will offer custom cocktails, premium wines by the glass and local craft beers on tap. The Bistro is a new food and beverage concept that will serve Starbucks coffee, a full breakfast, and offer quick-serve dining, all in a relaxed atmosphere. The Courtyard by Marriott Irvine Spectrum is located across the street from world-class shopping and dining at Irvine Spectrum Center, the premier outdoor retail center in South Orange County. The new hotel will offer 8,500 square feet of meeting space, the largest of its kind in the immediate area. A spacious 5,000-square-foot ballroom features state-of-the-art audio visual equipment, flexible room configurations, 18-foot ceilings and an ample prefunction area that flows seamlessly out to a 3,000-square-foot events lawn for outdoor activities. The hotel also has a boardroom available for private gatherings. 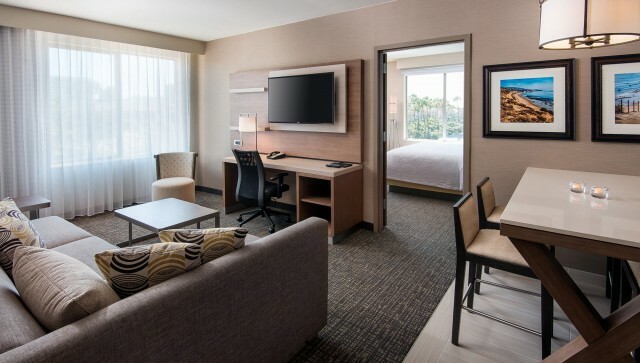 Located at the corner of Alton Parkway and Irvine Center Drive, the Courtyard by Marriott is reached via the San Diego (I-405) Freeway at Irvine Center Drive, Santa Ana (I-5) Freeway at Alton Parkway and Laguna Canyon Road (SR-133). Laguna Beach and Newport Beach are close by, as is John Wayne Airport, University of California, Irvine, and Disneyland. The room mix caters equally well to weekday business guests and weekend leisure and group travelers, with 94 king beds, 14 executive corner suites and 102 double queen bed configurations. The Courtyard by Marriott Irvine Spectrum will serve the growing demand for lodging regionally and from the 5,000-acre Irvine Spectrum, home to a 24 million-square-foot office and industrial market. R.D. Olson also has plans for a second 175-room hotel on the parcel adjacent to the Courtyard by Marriott Irvine Spectrum, with a groundbreaking for that development expected in early 2015. This latest hotel arrives amid a flurry of development projects by R.D. Olson Development, who was recently named Developer of the Year by Marriott International. The Irvine-based firm has completed seven hotels over the past three years, will deliver three hotels in 2015, and is in planning phase on the boutique Lido House Hotel in Newport Beach, Calif. The project was built by R.D. Olson Construction, who also was recently recognized by Marriott with their annual Icon Award for excellence in architecture and construction. R.D. Olson Development will retain ownership of the hotel, with management services provided by Marriott International. Based in Irvine, Calif., R.D.Olson Development is engaged in the development and repositioning of commercial properties nationwide. A specialist in developing hospitality properties, the firm also develops office, retail, multi-family and recreational projects. Robert Olson founded R.D. Olson Development in 1997 following nearly 20 years as founder and CEO of R.D. Olson Construction. The firm’s portfolio of developments may be viewed at www.rdodevelopment.com.